Lots of things to talk about in the latest patch, but I wanted to start with what I think is the shortest and simplest to sum up: the Arcann romance. I'm going to apply a bit of a sandwich technique here to talk about both things I liked about it and where I think it could have delivered more. 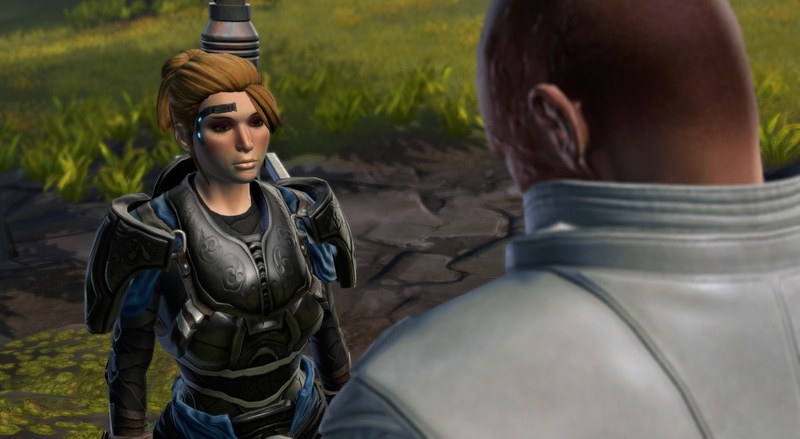 + It all starts with Arcann wanting to give you a gift, a breastplate that he claims to have forged himself. In practical terms, this is a green quality chest that is an ugly, mustard-yellow recolour of the chest piece from the Zakuul Knight set. Your character gets a dialogue option to comment on how beautiful it is. I'm listing this as a positive because I thought it was hilarious. My initial reaction on Twitter: "Really, Arcann? A green?" - You cannot react negatively to the whole situation in any way. I was kind of surprised that I noticed this since I hardly ever pick the "mean" options anyway, but I found their absence in the dialogue here quite striking. I don't think it's unreasonable to think that someone who spared Arcann's life might not actually like him all that much. Maybe they are still wary of him, or think that he has a lot to atone for after all the awful things he did while ruling Zakuul. The spectrum of emotions between liking someone and wanting them dead is quite large. However, there are no dialogue options here to express anything even remotely like this. You're forced to be cheerful and friendly towards him no matter what. - Biggest problem: the whole thing is super short. In the run-up to this patch's release, I once speculated about how they were going to make it not awkward to go through several cut scenes of romantic progression in a row. Turns out that Bioware's answer to this question was to not have multiple cut scenes. You just have one conversation that can end with a kiss if you like.. and that's it. That's not much of a romance in my eyes. I was also kind of hoping that your character and Arcann would go and do... something. Anything. Flowers picked on Odessen 0/10? Maybe not. But I want more out of this stuff than a brief conversation simulator. + For what it's worth, the Alliance alert works fine even if you don't want to romance Arcann. It's a lot like the last of the short conversations that your original class companions tend to have with you on your ship, where they tell you how awesome you are and how much they enjoy being around you. Actually, it's even a little better, because it doesn't feel as forced as some of those convos did. Arcann really does have major reasons to feel grateful to you. Final verdict: Good stuff but... come on, Bioware. I'm not expecting a whole visual novel here, but three lines of dialogue make for a somewhat anaemic experience. I've only done the Arcann mission on my main, and while I can see what folks might see in him, you summed up my character's position pretty well: I didn't kill him and accept his redemption, but that doesn't mean he should be off the hook for the war crimes he committed. Given the option, I would've tossed him jail. As for the armor, at first glance I can see why they chose that particular model for it, but it I found it weird that Arcann wants my character to dress like his mother. He’s definitely got issues. The short length of the companion missions is not awesome, but since it’s nearly two and half years since they vanished, we’re long overdue for their return. I would’ve preferred more “Profit and Plunder” and “Disavowed” style chapters (even if they don’t advance the main story) where we get to actually do stuff with them, but at this point, getting these characters back ASAP seems to be main goal. I do hope the companions don’t go quiet again like they did during Rise of the Hutt Cartel and Shadow of Revan and that the future story will be affected by which companions we have with us. Hehe, I hadn't thought about that armour potentially making you look like Senya. I wouldn't expect that to be Arcann's main association though, considering that he used to be surrounded by Knights all the time. I think you're right. I imagine we'll get a couple main characters to deliver the exposition. I don't know if it will still be Lana and Theron like it's been since SOR, or some new folks, but I wonder if Bioware underestimated how attached we can get to certain comps. Oh, when did Arcann react to you breaking up with Theron and how? Personally I also like it when NPCs take the first step and you can either roll with it or rebuff them, but I think many people have negative reactions to this sort of set-up. Tharan Cedrax, Doc and Corso come to mind... Also, it would be even "worse" now that romances aren't gender-locked anymore. I don't know if you ever played Dragon Age 2, but I remember quite a few guys freaking out at Anders (a male mage) flirting with them unprompted. Yet those same people would probably be happy to repeatedly flirt unprompted with a female character. Double-standards. Probably, but we don't really know. Do any of the existing female companions initiate romantic interactions with the player character? I don't know because I've never levelled a male character. I don't know if this particular commenter is going to come back or not, but I believe Dark Jaesa is the only female Companion to initiate a romance, but even then it's not directly implicit. From what I've seen of the videos she makes a comment that she reserves her interest for 'more accomplished men', which the Warrior can then instantly springboard off of to say that they are one such man and that's the romance beginning to blossom.